Explore Osaka just like a local: On a bicycle. 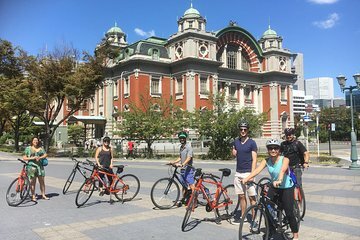 Pedal through the streets of the city on your way to its best sites, including Osaka Castle, Shitennoji Temple, and Shin Sekai, and follow your guide to some lesser-known attractions. Along the way, get insight into this fascinating city; its contribution to the history of feudal Japan, its distinctive dialect and culture, and its remarkable food scene—which you get a taste of by refueling with lunch at a local spot.